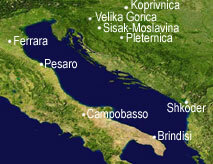 The priority for the Municipality of Shkoder is the building up of a technical unit in charge for the management and the planning of water resources, able to provide to the needs registered, to manage and implement interventions able to satisfy the town needs.Moreover the presence in the last 5/6 years of international donors in the field of water has produced a need of relationship in order to facilitate the management of the interventions gifted, without loosing opportunities and investments. Experimentation of a plant for canalisation and treatment of discharged urban waters. This intervention represents an integrative part of training acitivities and it’s an experimental attempt (transfert of knowledge and best practices from other partners of the project and from qualified technicians of the sector). My site has a lot of completely unique content I've either written myself or outsourced but it appears a lot of it is popping it up all over the internet without my authorization. Do you know any solutions to help stop content from being stolen? I'd certainly appreciate it. I'm really loving the theme/design of your weblog. Do you ever run into any internet browser compatibility issues? A few of my blog visitors have complained about my blog not working correctly in Explorer but looks great in Firefox. Do you have any ideas to help fix this issue? What's up i am kavin, its my first time to commenting anywhere, when i read this article i thought i could also make comment due to this brilliant article. Hello colleagues, its wonderful paragraph about tutoringand entirely defined, keep it up all the time. articles. I'll bookmark your blog and take a look at once more here frequently. I am rather sure I will be informed lots of new stuff right right here! Good luck for the next! I'm very happy to find this website. I want to to thank you for ones time due to this wonderful read!! I definitely loved every bit of it and i also have you saved as a favorite to look at new stuff in your website. Hey there! Quick question that's completely off topic. Do you know how to make your site mobile friendly? My blog looks weird when browsing from my iphone 4. I'm trying to find a theme or plugin that might be able to correct this problem. to be happy. I've read this post and if I could I desire to suggest you some interesting things or advice. Perhaps you could write next articles referring to this article. I want to read more things about it! http://bit.ly/11E6sdj Obviously, this is a niche that has outstanding growth potential, considering pet insurance costs are nominal and the long-term savings can be substantial. If your loved one has something wrong with them a trip to the veterinarian can get very expensive.